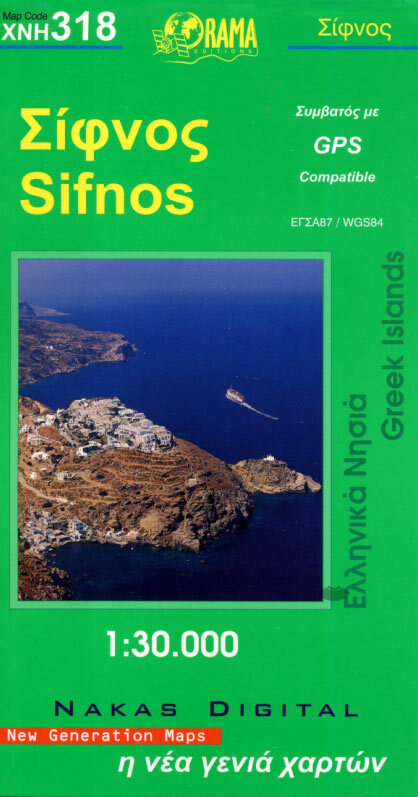 The entire road network of Sifnos and even the paths. Accurately distances in kilometres. All beaches with names. Special sign for the beaches which awarded by Blue Flag. Few words for some villages and sightseeings. Names of mountains, crests ans toponims. Coordinates in Geodetic System GGRS87 & WGS84. Hotels, campings, index of villages, tourist information. City plans: Apollonia, Kamares, Agia Marina, Kastro, Vathy, Faros, Platys Gialos. Tourist guid on sighs of the island, internal transportations, photos and few words for all beaches, hotels, campings, etc.